Some elements of this new output by the Wien-based supergroup of experimental improvisers brought my mind back to their self-titled debut album when the line-up was slightly different. There was Radu Malfatti, who recently focuses on extremely rarefied stuff (really close to silence), on that occasion, and there wasn't Burkhard Beins on percussions, but both records have references to directions. Geographical directions and compass points on their first release, x-, y- and z- axes in three-dimensional reference system seven albums later. Moreover the sound, coming from the aggregation of each performer, which probably will sound like Malfatti's quasi-silent ultraminimalist researches if they were performing as solo instruments, has some resemblances to that output, but time and mutual performative understanding play a really important role in this ever-changing stylistic fields and such a harmonic interaction is clearly audible, even if likewise the parallel lines of cover artwork by Claudia Marzendorfer, each single input doesn't really touch the others, even if they chorally render the illusion of being part of a whole or a single coherent unit. It's like playing jigsaw puzzles before the gamer understands that its interlocking parts are impossible to get joined together! This sort of fake overlapping is clear on the first of the three track - "UNX" - as well as in the first half of the second one "UNY", whose second part features an asymptotic mutiny, which sounds fostered by Michael Moser's elongations on cello. Their sort of impossible amalgamation reaches an astonishing and almost maniacal balance on the third part of this release, "UNZ", where a listener can clearly understand the fact Polwechsel managed to inhabit an interesting stylistic region in between totally imperfectly abstract improvisation and extremely lucid and "geometrical" composition. 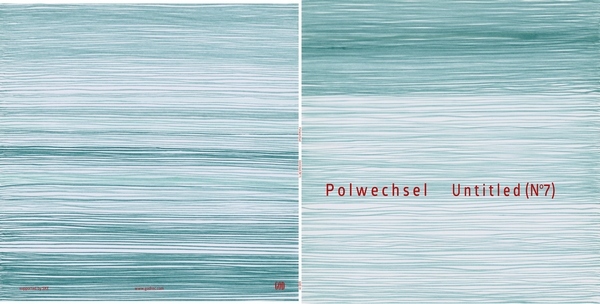 I’m interested to learn that Polwechsel have been operating for about twenty years now. By the time AMM had reached their 20-year mark they had become the relatively-stable lineup of Rowe, Tilbury and Prévost, with occasional guests such as the cellist Rohan de Saram on 1987’s The Inexhaustible Document. They’d already been through the painful dilemmas posed by the presence of Cornelius Cardew (the highly ideological composer) in their original configuration, and trying to extricate themselves from the restricting labels of “free jazz”. And that was before the terrible Prévost-Rowe bust-up, a rift which doesn’t look likely to heal any time soon. I mention this because Polwechsel have been through a few changes themselves; the trombonist Radu Malfatti left after only two years, but as I understand it he’s since aligned himself with more hard-core elements and the further he goes down the conceptual path, the less noticeable is the sound of his trombone. John Butcher, the English saxophonist, used to be a member and so did the Austrian guitarist Burkhard Stangl. There may be lengthy interviews with any one of these people explaining why they left Polwechsel, or not. At any rate, Polwechsel don’t appear to have been driven by the same sort of ethical passions as AMM, and there doesn’t appear to be a political left-wing dimension. Matter of fact, the press notes here remind us that the combo were formed at a fascinating time in the mid-1990s, and the writer proposes multiple important forces that should be taken into account. Modernist composition; free improvisation; the “embrace” of noise, rock music, and electronic glitch music (shading into what the press notes identify as “club culture”). They also refer to “profound changes” across these genres, and by pointing to places such as Vienna, Berlin and Tokyo we’re referring most likely to the forms of playing which have been variously labelled as Onkyo, Reduced Playing, or EAI. I realise from all the above that Polwechsel are not only more significant players in this rich mix than I thought, but I also haven’t heard enough of their music. On Untitled (No 7) (GOD RECORDS GOD31) Polwechsel are represented by Werner Dafeldecker on double bass, Michael Moser on cello, and the two percussionists Burkhard Beins and Martin Brandlmayr. On paper that is kind of an umpromising set-up; no recognisable “lead” instrument, nothing like a traditional jazz configuration where you might expect a saxophone or a guitar. What they produce is an incredibly subtle array of drones and brittle, rattling percussion; everything dry as dust, yet supple and rich. There are a number of apparent contradictions. None of the excessive “high energy” of old school free improvisation, yet it’s not as empty or tedious as much “reduced playing” can often be. I don’t hear any strained, self-conscious attempts by the players to extend their technique, and I’m glad; extended technique is another unwelcome element which has been blighting free playing for many years now. Polwechsel’s music appears very natural, unforced. There is no showing off whatsoever, no self-evident “star performer” forcing their way to the front of this dynamic, textured blanket of sound. It doesn’t feel composed in the sometimes awkward, stiff programmatic manner that even some of my favourite composers (Xenakis, Varèse) cannot seem to escape; yet there is utter assurance and conviction in every note they play. There’s evidently some iron control and strong willed discipline at work, yet the group still manage to syncopate and swing. A number of small miracles are quietly taking place on this record. In negotiating all of these oppositional elements, Polwechsel are effectively walking a tightrope across Niagara Falls, while juggling and turning backflips at the same time. Matthias Haenisch in his notes refers to a re-evaluation of the boundaries of culture in the 1990s, a process which by his account included more than just music, and one in which he claims that Polwechsel were active participants. Haenisch goes further and asserts that “more than anything else, they called into question the polemically-defended former opinion of a dichotomy between composition and improvisation.” 1 This means, I assume, that Polwechsel were not content with the glib term “instant composition” which served well enough for the players of the Instant Composers Pool in the 1960s and 1970s, and devoted themselves to what I suppose was a very difficult and lengthy task, which is undefined, but something which could only be achieved by actually playing it and doing it over the course of the last 20 years. Are they succeeding? Haenisch is unequivocal: “This has resulted in musical concepts and performance practices that traditional terms alone can no longer adequately describe”. ….. Ähnlich wie The Necks, wenngleich nicht kontinentübergreifend, überbrückt das Quartett Polwechsel zwei Städte, leben seine Musiker doch in Berlin,Wien und zwischen beiden Städten. Polwechsel kombinieren zudem freie Improvisation und strenge Kompositionsverfahren. Ihr Klang ist dabei geräuschhafter, weniger melodisch und stärker auf eine Auswahl bestimmter musikalischer Elemente konzentriert. Ihrem abstrakten Ansatz gemäß heißt ihr jüngstes Album folgerichtig „Untitled (No. 7)“. Wobei Abstraktion, ganz wie in der Malerei, ein Loslösen von vertrauten Mustern meint. Die auf diesem Wege produzierten Klänge hingegen sind in ihrem Insistieren auf der eigenen Materialität durchaus konkret. Man kann darin die verschiedensten Muster erkennen, beliebig wirkt bei ihnen nichts. Vielmehr ist ihr meditativ anmutendes Vorgehen wie eine Verdichtung der kleinen Gesten zur großen Struktur. improvisation and improvised music is always hard to describe, explain and judge as there are - in many cases - simply no rules that apply nor formal structures one might refer to. This goes for the music of Polwechsel as well which have been making waves in the Improv scene for two decades now and only recently released their seventh longplay effort via God Records. Mostly percussive and meandering around varying structures free floating between a Free Jazz-reminiscing approach, improvised, simmering tribalisms and the loose rhythms of conjunctional works created by the likes of Burnt Friedman & Jaki Liebezeit all tracks - "UNX", "UNY" and "UNZ" - are built around drums and other instruments abused as such whilst string instruments like guitar, bass and cello as well as xylophone cater additional, non-melodic, yet complimenting textures and, especially in "UNY", a calming, cinematic layer to a buzzing percussive antsiness or, talking "UNZ" here, a playful take on both melancholia and off-kilter outbursts. Thrilling. Il ritorno sul luogo del delitto quattordici anni dopo. Non e solo il comeback al non-titolo a segnare, per i Polwechsel, la ripresa di una strada lasciata indietro molto tempo fa. Per chi ha seguito l'evoluzione del percorso artistico del supergruppo con base a Vienna, il settimo "Untitled" arrivera a generare piu sorpresa di quella che era lecito attendersi. Nonostante la struttura stessa del progetto, da sempre luogo open-minded per lo sfogo di una creativita temporanea, passeggera e irripetibile da parte dei suoi componenti, lasci da sempre aperta ogni porta a qualsivoglia genere di sviluppo sonoro, puntualmente esaminato e sperimentato fino all'ultima frequenza udibile. Cio di cui si sta parlando altro non Ã¨ se non il ritorno all'astrazione. Qualcosa che la parabola dei Polwechsel aveva lasciato indietro appunto al 2001, al terzo (e da allora ultimo) "Untitled", provocando l'abbandono del progetto da parte di Burkhard Stangl prima e John Butcher poi. Da allora, l'arte occasionale del gruppo aveva sviluppato un rapporto per certi versi intrinseco con il concreto, muovendo da una forma personalissima e distorta di paesaggismo ("Archives Of The North") a squarci sonori su illustrazioni mimetiche (lo splendido "Fields" con John Tilbury a seminare ferite) fino a studi di carattere autenticamente ambientale ("Traces Of Wood"). Ormai solidamente imperniata sull'ossatura a quattro Dafeldecker-Moser-Brandlmayr-Beins, l'esperienza Polwechsel torna qui a parlare un gergo corale, facendo venir meno quella necessita di una leadership che aveva portato a "spartirsi" la paternita dei ruoli-guida in gran parte dei lavori del passato anche non prossimo. Le tre suite che compongono il disco sono co-firmate dai quattro come non accadeva addirittura dal primo parto del progetto nel 1995, con i soli Moser e Dafeldecker presenti in formazione: segno di una ritrovata sinergia e di un affiatamento collaudato, anticamera di un disco in cui proprio questi fattori risultano essere decisivi. Gia dai primi sussurri di "UNX" protagonista della scena e il suono della liberta creativa, vivisezionato con quell'approccio scientifico divenuto tratto distintivo del marchio Polwechsel, attuato pero con inedita spontaneita. Liberta e dunque intesa non piu come evasione dalle regole e dai canoni in nome dell'istinto puro (AMM), ma semmai come utilizzo e interpretazione a piacimento degli stessi. Ad alternarsi sono singoli suoni dei quattro strumenti, incastonati l'uno all'altro con precisione chirurgica ma con la massima naturalezza, senza la minima forzatura, tenuti al volume piu basso possibile, scanditi quasi sottovoce. Meno formalmente preciso e piu sviluppato nella sostanza e il saliscendi di "UNY": al gioco di combinazioni si sostituisce uno studio sulle sfumature timbriche che attraversa piu fasi, da quella percussiva e marcatamente free-jazz della prima meta in duetto fra gli intrecci ritmici Brandlmayr e Beins e il contrabbasso di Dafeldecker, alla digressione lenta e sinistra della seconda, affidata quasi in toto al violino di Moser. Temperatura ancora piu alta nella metamorfosi kafkiana di "UNZ", l'episodio meno sotto le righe del lotto, che modifica la prospettiva intersecando suoni altri (distorsioni, battiti amorfi, scontri tonali) con il medesimo approccio combinante. Un'autentica lezione sonora ad opera di un quartetto che, nella sua costitutiva e necessaria instabilita creativa, dimostra di aver raggiunto un decisivo e definitivo equilibrio strutturale. Forse non il piu emozionante ne il piu altisonante dei dischi firmati Polwechsel, di sicuro uno dei capitoli piu importanti per il percorso del marchio. Nonche l'ennesima dimostrazione di classe e maestria da parte di quattro fuoriclasse. Polwechsel är en snudd på legendarisk ensemble men jag har trots det aldrig lyssnat in mig ordentligt på dem. Så när jag fick nya skivan untitled (no 7) i handen tänkte jag att det äntligen var dags att uppt äcka Polwechsel. Det ångrar jag inte. Ensemblens medlemmar har varierat lite under åren men har sedan en tid tillbaka stabilserats kring Michael Moser (cello), Werner Dafeldecker (kontrabas) och slagverkarna Martin Brandlmayr och Burkhard Beins. Tidigare medlemmar är Radu Malfatti och Burkhard Stangl och Polwechsel har gästats av Fennesz, John Tilbury och John Butcher. Idel tunga namn, det är verkligen en supergrupp det är tal om. Om man tittar på namnlistan får man en ide om vad musiken handlar om: den hårfina gränsen mellan komposition och improvisation, mellan konstmusik och jazz. I den världen rör sig Polwechsel lätt och smidigt. De får allt att låta självklart, samtidigt som de hela tiden balanserar på gränsen till det okända. Det går inte att urskilja vad som är komposition och vad som är improvisation, men stundtals får man känslan av att det är något (eller någon) som styr musiken. Men så plötsligt flyter allt iväg igen och öppnas åter upp. Jag är svag för slagverk. Speciellt när soundet står i centrum. Brandlmayr och Beins är mästare på att locka fram de skönaste ljud ur sina instrument och på untitled (no 7) är det konstant fest för öronen. Även Moser och Dafeldecker låter sina instrument tala och när de fyra instrumenten vävs ihop är det inte bara mäktigt utan även vackert. Öppningsspåret "UNX" är uppbyggt kring korta torra ljud som sprätter omkring i alla riktningar. Soundet i alla instrumenten är det viktiga och man spänner verkligen öronen. Andra spåret "UNY" känns mer strukturerat där olika delar byter av varandra. Drone-partiet efter dryga fyra minuter är väldigt snyggt och glissandot i stråkarna i slutet är rysningsframkallande. B-sidan täcks upp av långa "UNZ" som är det oroligaste stycket med hårdare och mer skärande sounds, fler tvära kast och mest aktivitet. Polwechsel är en fascinerande ensemble med ett unikt sound, något de jobbat fram och förfinat under 20 års tid. De lyckas öppna upp musiken på ett sätt som inbjuder till tolkning. Det är suggestivt men inte introvert. Man får som lyssnare ta del av skapandeprocessen, Polwechsel spelar underbar musik, vi får själva skapa vår egen berättelse. UNX, UNY, UNZ – drei Titel, für die diesmal alle vier Polwechsel-Mitglieder verantwortlich zeichnen. Freie Improvisation statt konziser und bisweilen strenger Konzepte? Doch ist das Wissen um die Ent ste hung der Musik notwendig? Hört man Musik anders, wenn man weiß, ob sie streng komponiert ist, sich an mehr oder weniger strengen Spielkonzepten orientiert oder – wie es so schön heißt – „frei“ improvisiert wird? Eine Frage, die Musike rInnen wie HörerInnen schon lange beschäftigt, gerade auch, um den Besonderheiten von Komposition und Improvisation gerecht zu werden, aber auch, um Unterschiede und Gemeinsamkeiten herauszuarbeiten. Polwechsel, das steht fest, ist nicht nur seit zwei Jahrzehnten eine feste Größe in der Szene der Echtzeitmusik oder auch der „frei“ improvisierten, experimentellen Musik. Polwechsel steht paradigmatisch für eine Formation, die nicht nur langjährig zusammenarbeitet, sondern deren Mitglieder proben und über ihre Musik diskutieren, vor allem aber sind sie Composer-Per former, entwickeln Konzepte und Kompositionen für ihr Quartett. Untitled (N°7) heißt ihre achte Veröffentlichung, diesmal als LP. Und sie improvisieren in eng verzahnter Interaktion, die langjährige Erfahrung nicht nur des Zusammenspiels, sondern auch des kompositorischen Denkens in steter Präsenz. Polwechsel nimmt seinen Bandnamen ernst. Neben frei fließenden, geschichteten Klangflächen hört man vor allem die Perkussionisten immer wieder luftige, zugleich drängende pointillistische Texturen spielen, während die beiden Streicher einmal zarte Einwürfe und Kommentare hinzu setzen, um sich zu anderer Zeit in das dichte Gewebe einzuklinken. Es ist keine laute Musik, wohl aber voller Energie, voller Präsenz. Nicht plakativ, sondern konzise, wie man es von Polwechsel gewohnt ist. Polwechsel groovt! Nein, nicht mit durch laufendem Beat oder Puls, letzterer scheint eher abstrakt durch, manchmal klar, dann wieder gebrochen. Subtil, tänzerische Leichtigkeit wären weitere Assoziationen. Sans plus d’invité – mais c’était déjà le cas sur son précédent disque, Traces of Wood –, Polwechsel retournait en 2012 à son art délicat. Dont le support change, puisque c’est sur vinyle que l’on retrouve aujourd'hui Michael Moser, Werner Dafeldecker, Burkhard Beins et Martin Brandlmayr. Comme l’illustrent les lignes serrées de la pochette du disque : sous les profondeurs, c’est bien l’azur que trouvera la formation. Quatre percussionnistes qui, d’abord, envisagent à fond de cale – presque en secret – l’étendue de nouvelles possibilités : les coups sont nombreux, pour la plupart retenus mais endurants aussi, et les mécanismes travaillés interrogent sans cesse l’équilibre commun. Est-ce pour que l’ouvrage n’échappe pas aux fondateurs Dafeldecker et Moser ? Si, dans le deuxième des trois temps du disque, les frappes de Beins et Brandlmayr sont plus volontaires, les cordes déposent quelques harmoniques et puis d’épais bourdons qui font impression. C’est alors que Polwechsel gagne les hautes sphères, avec autant d’obstination que de finesse. Mais c’est devenu une habitude.